Knowing when to replace your wheels and tires is a critical component of car-ownership, especially if we’re talking like a vintage car such as the 280Z. A stock 280Z requires a tire-size that is quite unusual today, so a tire change is not necessarily as simple as it would be on a modern vehicle. However, the guide below should serve as a helpful resource in identifying the right replacement wheels and tires for a 280Z. We will provide recommendations for the best-value replacement options and how to choose the wheel-tire combo that will maintain originality and performance for your 280Z. Our top tire recommendation is a Fuzion Touring All-Season Radial Tire. This is the only tire I have ever run in my 240Z and it is simply a great-value tire. Before you even begin to consider the best new set of wheels for your 280Z, you should familiarize yourself with the sizing you should be looking for and how to interpret it. If you don’t care so much about these measurements, you can scroll down to our “Best Tires and Wheels” section to see which wheels and tires we recommend for your 280Z. A width of 195mm, meaning the width of the tire from sidewall. An aspect ratio of 70%, meaning that the tire’s height is equal to 70% of the width. A radial construction, meaning that the layers of the tire run radially across the tire. A diameter of 14″, meaning the size of the wheel from one end to the other. A 14″ tire is meant to fit a 14″ wheel. The wheel sizing for a 280Z is a 5.5Jx14 ET15, meaning a 5.5″ width and a 14″ diameter, with a 15mm offset. Choosing which tire to outfit your 280Z can be a difficult process, especially with a vintage car like the 280Z and a slightly-unusual tire-size like the 195/70R14. You may notice that the tires below are all linked to online listings and you can purchase them online. We recommend buying online as it is generally significantly cheaper and you won’t run into the issue of your local shop not having a 195/70R14 available. Typically, shipping makes this an expensive thing to purchase online, but most Amazon retailers offer free shipping on tires. Another new feature offered by Amazon is the option to have your tire shipped to a local installation center and to schedule an installation time all through Amazon! Just click a ‘Select a Service Option’ on the tire you wish to purchase to see which options are available in your area. In my area, they charge approximately $15/tire through this service — All in all I recommend buying through Amazon to make your tire purchase and installation significantly cheaper. The Fuzion Touring All-Season Radial tire is a great-value option which offers long-life from an extremely reputable company. This is my top recommendation as it is the only tire I have ever run in my 240Z (and the previous owner) and has always proven to be of fantastic value. This will fit stock wheels perfectly and will ensure the good chunk of change you will be spending on new tires will not go to waste quickly. This CS3 Touring Radial Tire from Cooper Touring is another affordable yet high-quality option for 240Z tires. The CS3 tire boasts new ‘STABILEDGE’ technology which Cooper Tire claims improves wet and dry traction through multi-dimensional siping (a process to improve traction and braking without impacting the feel of the ride). Cooper Tire offers a 65,000 mile treadware protection with this option. This is an all-season performance option with fantastic features, but without a sky-high price, making it our #2 recommendation. The Westlake RP18 Touring Radial Tire is the most affordable option listed here. This tire comes at a significant discount from the Fuzion Price which may come with a similar decrease in wear-life or performance handling, but it will do the job if you are just looking for a cheap option that will work. These tires offer a smooth ride and will fit your 280Z just fine if you are not in need of a performance tire. Aluminum slotted mags are a classic, timeless option for wheels on your 280Z. In the American market, they actually offer a sense of originality on your 280Z despite not being the original set of wheels the 240Z came with from the factory. For more information on originality, check out our ‘Original Wheels and Hubcaps’ section below. 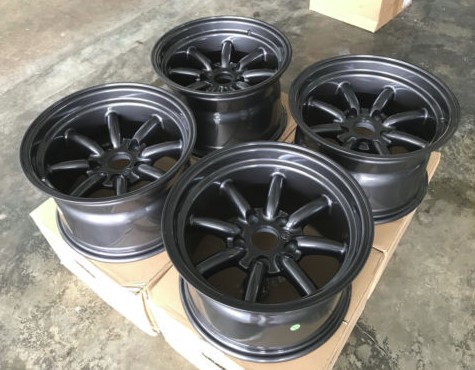 These particular wheels are no longer produced actively, but you can certainly find great examples on eBay by running a quick search for 14×7 aluminum mag wheels. You can expect to pay somewhere between $50 and $100 per wheel on these, and they may require some restoration, but they will go a long way in preserving the original look most people remember from the American 280Zs of the 70s. Like the Datsun 240Z, the 280Z always had a thriving mod community, those who built up their 280Z hot-rod style in both the performance and cosmetic categories. 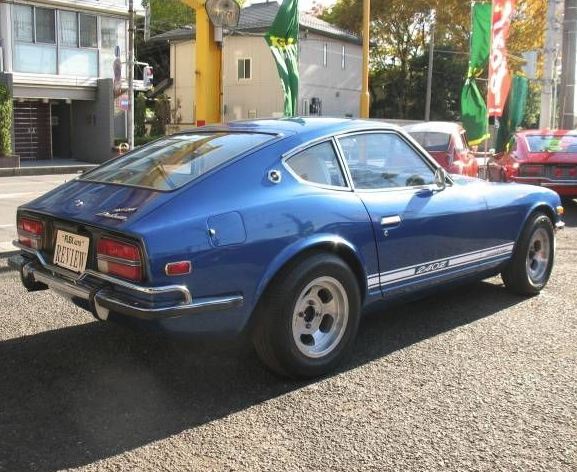 The S30 was a prime mod candidate, especially in Japan where it was known instead as the Fairlady. The choice of wheels for any of these modified Z cars: The Panasport RS Watanabe. As Dave Sholz, owner of a beautifully modified 240Z, said: “Quite honestly, the artists had that wheel and tire combo drawn on that vehicle.” The Panasport RS Watanabes are difficult to find nowadays, and even more difficult to find affordably. You can find them on eBay, such as this pair of off-brand Watanabes. This particular diagram of tire wear comes from the 240Z & 260Z Haynes Repair Manual. Generally, you can quickly tell that your tires need to be replaced by visual inspection and experience. However, if you are unsure, you should go by the rule that the tire tread should never go below 1/16th of an inch remaining, and this guideline comes with a handy tool you already have in your pocket: a penny! Insert a penny upside down into the tread, and if Lincoln’s head is entirely visible, you need new tires. Other indicators that you need new tires and that you also have some other abnormalities that need to be sorted are shown in the diagram to the left (or above, if you’re viewing this page on a mobile device). This diagram comes from the Haynes 240Z and 260Z manual, our top recommendation of repair books for the 240Z and 260Z, but the tire advice applies to any car really. 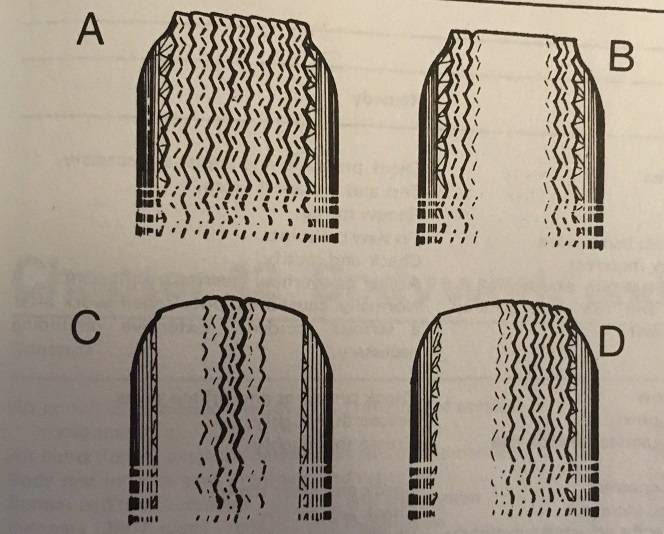 The abnormalities from the diagram correspond to: (A) ‘Feathering’ from front-wheels toeing in our out incorrectly, (B) Over inflation, simply deflate to remedy this, although you may still need new tires, (C) Under-inflation, which may also require new tires along with ensuring you are properly inflating the tires, and (D) Uneven wear due to worn or incorrectly adjusted wheel bearings, or excessive toe-in or incorrect camber. Wheels should be replaced if you have damaged them somehow. What may seem like cosmetic damage, such as curb-rash, may actually also be structural damage that calls for wheel replacement entirely. Whenever your wheels are removed, you’re going to want to check for mud, break-pad dust, or rust, and repair at the first sign of any of these. Another important maintenance tip is to re-balance your wheels halfway through the life of your tires to compensate due to rubber-loss due to tire wear.